So, this is what I’ve been missing the last three months? After all the dreck that the X-titles could be at times, there was so much headache trying to wade through years through of continuity. 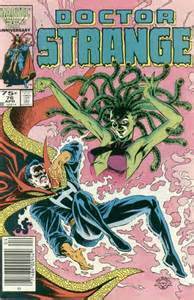 I’m two issues into Doctor Strange, and I won’t know what’s going on in the next three, but it doesn’t matter. There’s just enough to get by. That being said, I want to know more. There’s a sense of backstory throughout this issue that never gets fulfilled, though it’s mentioned at the edges of inference. We’re told that the doctor who is the subject of this tome has some history with the Doctor. There’s something missing, too, in the other doctor’s motivation. I get why it is that he delves into said debaucherous sorcery, but you don’t really get a handle on the descent. It’s a shame. I’d much have rather seen Regular Joe’s story than that of the villain. Other than that, really stellar art and story. Bitchin’ twisty ending that I didn’t see coming.